United Fidelity Bank has more than 10 branches located in Indiana, Illinois, Ohio, Colorado, Florida, and United States Virgin Islands, as well as more than 92,000 free ATMs nationwide through the MoneyPass, Allpoint, and Alliance One networks. It offers business savings and checking accounts, lending, merchant processing, direct deposit, and safe deposit boxes. It is rated A+ by the Better Business Bureau. Ready to get started with United Fidelity Bank business checking? Apply now. United Fidelity Bank has more than 10 branches located in Indiana, Illinois, Ohio, Colorado, Florida, and the U.S. Virgin Islands. It is also a member of three nationwide surcharge-free ATM networks: Allpoint, MoneyPass, and Alliance One. You can use its website to check which locations are closest to you. 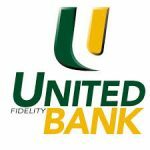 United Fidelity Bank also offers the following business services: business savings and money market accounts, credit cards, lines of credit, business term loans, Small Business Administration funding, commercial real estate financing, and working capital loans. Currently, it does not offer wealth management. Find out more about its small business offerings on its website.